The world has been captivated by the display of grief as an orca whale mother (Tahlequah also known as J35) has carried the remains of her baby on her nose through the waters of the Salish Sea for days. A member of the critically endangered sorter resident clan of orca whales, Tahlequah gave birth to her calf on July 24. For reasons unknown at this time, the calf lived for only half an hour. Since the death of her newborn, Tahlequah has been carrying the lifeless body on her nose or in her mouth in an unprecedented display of grief as she and her pod have moved northward through the San Juan Islands. There are many excellent articles and reports about what Ken Balcomb, the founder of the Center for Whale Research, is calling a “tragic tour of grief.” You can read the timeline of this maritime mourning through The Seattle Times as well as through many other press and publications. This sorrow that we are witnessing is hitting our hearts hard. People are reporting feeling an empathetic response to J35’s loss as they reflect on their own profound suffering and heartache. Within this mutuality, there is also an overwhelming sense that we are beholding an anguish beyond the edge of even our own human comprehension. We may mourn with Tahlequah, but will it be enough to bring about the requisite change to ensure the future of this magnificent form of life? This grief tour is the death knell of extinction. How does one put down the body that contained the very kernel of hope for survival? How does one let go of the embodiment of faith that ensures that there will be a tomorrow? The beloved and decomposing body Tahlequah carries is a clarion call to awaken the world to the collective bones of mass extinction; it is beyond a strident warning. It is a SEE ME and WAKE UP demand to confront what our human presence is doing to the biodiversity of the more than human world. This is her flag, her desperation, her plea. We can no longer just bear witness without bearing the arms of action. We can no longer simply stand beside as another species ceases to exist on account of our human-centered ways. 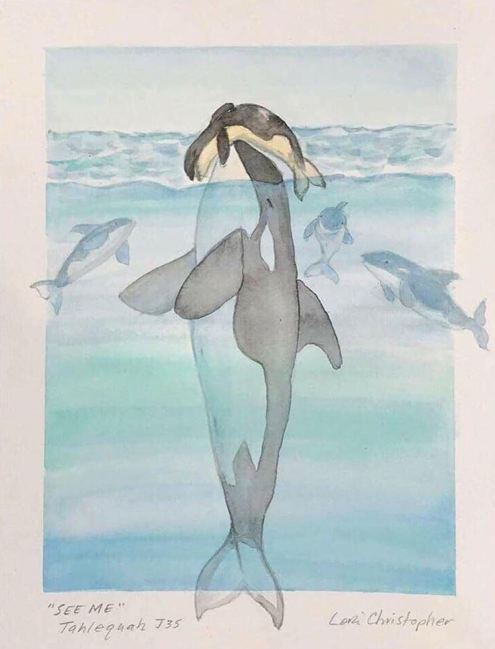 To think this orca pod will remain without changing anything is insanity for we cannot expect different outcomes while repeating the same behaviors over and over again. Furthermore, to not change our ways, to simply allow this precious form of Life to starve away is a form of evil for which I do not know how we can account. This week I have been daily present to the very waters that this pod calls home, a sea where I have seen the black triangular fins slicing through waters, orcas breaching and swimming my whole life. This week the waters have been still and silent, eerily echoing the steady loss of biodiversity and life of this orca calf. I have stood by the sea, salty tears streaming down my face, asking this great body of Living Earth what needs to be done; desperate for a hope that would emerge through the very lapping waves that also carry Tahlequah and the bones of her babe. It is not a mystery why these beings are being brought to the brink of extinction. She is informing us of what needs to be done. Tahlequah as Mother, as the archetypal portal of future generations, as the very seat of Creation is stoically carrying her calf as a clear and stirring command to abandon our still-birth ways that lack the life-force to listen deeply to animals, birds, Earth, and those that live within the sea. She is calling out to us as a great prophetess of the sea, echoing Job's wisdom that the more-than-human world offers us insight and understanding to the Sacred and our True Selves. She is informing us in the most poignant and powerful of ways to no longer see ourselves as separate and apart from the great assembly of creation: will we hear and respond? Respond with Hope. Respond with Action. It has been 3 years since there has been a successful birth for the Southern Resident Orca. These whales have a 19 month gestational period and because they are starving to death they are losing these babies in the late term of pregnancy. There are very few breeding pair possibles left and if something doesn’t change NOW extinction is inevitable. This pod has lost nine of them in a one year period due to starvation. Now there 75 whales left....the lowest number in almost 50 years after the population of these families were decimated by a rush on Orca captivity for aquarium entertainment. Scientists agree that the only thing that will save this beloved species from certain starvation is the breaching of the Lower 4 dams on the Snake River allowing the salmon a habitat up river in which to spawn in cold clean water. Salmon is a key staple food source for this orca population and it is because of a lack of this food source that the orcas are starving. Contact Washington and Oregon Senators & Governors as often as you can in response to what Tahlequah is requesting. Below are then numbers that need to be called and a script to help you if you aren’t sure what to say. If you are asked for a Zip code and don’t live in Washington use 98101. And if you live in Washington and need a Oregon Zip code 97212. Call Gov. Inslee (WA) (360-902-4111) & Gov. Brown (OR) (503-378-4582) and tell them to breach the lower 4 dams on the Snake River! "Hello Governor or Senator _____________ My name is _________ and I am calling to insist you implement the plan to breach the lower 4 dams on the Snake River with no further EIS (environmental impact studies) We have completed these studies for 25 years costing tax payers millions and the answer s always the same the only way to save our salmon is by increasing there spawning habitat. These constant studies are just a stall tactic. Meanwhile the Salmon of the Pacific Northwest and the Southern Resident Killer Whales are going extinct. The time is NOW.... Ken Balcom from the Center for Whale Research says if we are lucky we have another have until the end of 2018 to get started breaching. In addition these dams aren’t adding even adding power to the grid and are costing Tax payers millions. DON’T let this happen on your clock do the right thing....let it be your legacy Breach the lower 4 dams on the Snake River NOW to save millions of tax dollars annually, bring wealth & jobs to a region and restore salmon runs which will save the southern resident Orcas from going extinct." Thank you to Michelle Seidelman for this wisdom and guidance for how to act in response to our empathetic grief.